Will Smith and his son Jaden, 12, are to star in a sci-fi film - their first big-screen appearance together since 2006 drama The Pursuit of Happyness. It will feature a boy who tries to save himself and his estranged father after their ship crashes on an abandoned Earth, 1,000 years in the future. M Night Shyamalan will direct and co-write the as-yet-untitled film. The Sixth Sense director said making "a scary science-fiction film" with the pair was his "dream project". Will Smith and wife Jada Pinkett Smith will co-produce, as they did on last year's Karate Kid remake in which Jaden appeared. The Pursuit of Happyness, based on the memoir of stockbroker Chris Gardner, told of a down-and-out family man left by his wife to bring up his son. Smith's portrayal of a salesman trying to prove himself in 1980s San Francisco earned him a best actor Oscar nomination in 2007. 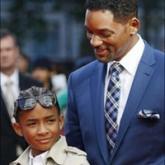 Jaden, who played Gardner's son in the film, previously appeared in 2008 sci-fi remake The Day the Earth Stood Still.